Some may think “Virginia Is For Lovers” is just another marketing slogan but at least in the case of Virginia’s Wintergreen Resort and from a golfer’s perspective there’s a lot to like if not love. 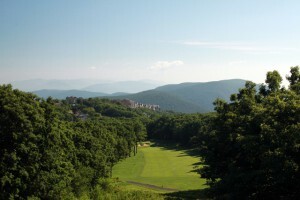 Wintergreen has a well-deserved reputation as a family-oriented ski resort but the rest of the year it’s a destination where the same mountains offer visitors the chance to play some really memorable golf. The 11,000-acre Resort is located in the jaw-droppingly-beautiful Blue Ridge Mountains which if you have never been there should be immediately put on your list of places to visit. Near the Blue Ridge Parkway on the eastern side of the mountains southwest of Charlottesville, Virginia, Wintergreen is about a two hour drive from Richmond and three hours from Washington, D.C.
Wintergreen’s two courses, Devils Knob for resort guests and Stoney Creek open to the public, are very different and each is worth playing. Describing Devils Knob the first and most important thing (you will thank me for this) is bring your camera and don’t think you can get by with the one in your smartphone. The 1976 Ellis and Dan Maples design has views and vistas deserving the best pictures you can take. The sign near the practice green lets you know this is mountain golf and in fact Devils Knob is the highest course in Virginia at 3,523 feet. Laid out before you is the panorama of the Rockfish and Shenandoah Valleys with some of the furthest mountain peaks 50 miles away. 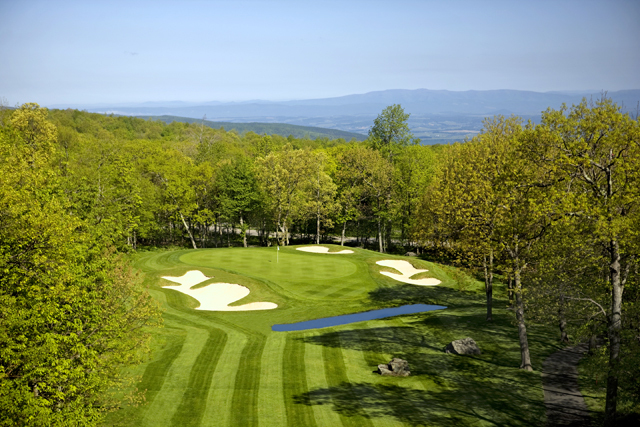 Devils Knob is a very playable 6,712 yards par-70 from the back tees but to have the most fun be sure to select the proper tees for your game. There are three additional sets from which to choose allowing golfers of all skill levels the opportunity for an enjoyable round: white 6,123 yards, gold 5,625-yards and red 4,443-yards. As you might expect many of the holes play either up the mountain or down the mountain and the routing traverses through tall stands of oaks and maples. There’s also the opportunity to see lots of wildlife including both deer and bears since the 6,000-acre Shamokin Springs Nature Preserve adjoins the course. 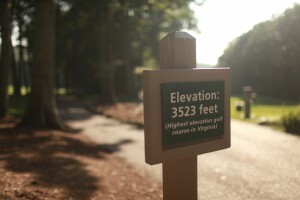 Run by the Wintergreen Nature Foundation, the Preserve’s Nature Center can be seen near Devils Knob’s 17th hole. The greens of mountain have the tendency to break towards the valley and though we found them to be receptive to a well struck iron shot, mishits had the annoying habit of running down into greenside chipping areas or one of the many bunkers. There are also lots of granite outcroppings, mostly out of the line of play, but some very odd bounces into some unfortunate places can be the result of ball-rock contact. The very first hole shows what to expect during your round at Devils Knob. The par-4 (411-yards from the blue tees) bends slightly to the right around a bunker and with a drive in the fairway the green should be easily reachable. But be cautious with your second shot. The putting surface is not very large, only 27 paces deep, and from the fairway looks like there’s a bit of a false front but that’s an illusion created by the elevation change. Number one however does offer you the opportunity to get your round started with a par or even a birdie. The strength of Devils Knob is in the par-4s and 16 is one you will enjoy. Again downhill from the tee but your attention will be challenged by the spectacular view of the valley below. And speaking of views, on fourteen before hitting your drive through the chute of trees leading to the fairway, look behind you. The miles and miles of mountains you see are worth a second or even third look and are a real photo opportunity. The other course at Wintergreen is Stoney Creek and it’s not on the mountain but below in Rockfish Valley. The difference in elevation, almost 3,000 feet, and topography makes a totally different experience than Devils Knob. There are three nines here; the original 18 holes, now the Shamokin and Monocan nines, and the Tuckahoe nine. All are Rees Jones creations with Shamokin and Monocan opening in 1988 and Tuckahoe in 1998. Jones is often called “The Open Doctor” because of the many times the United States Golf Association has called in him to overhaul courses in preparation for holding our national championship. Seven times in all Jones has worked his magic on Open venues including Congressional Country Club and Bethpage Black plus his talents haven’t been missed by the PGA of America since he has redone eight PGA Championship venues including Baltusrol for this year’s PGA Championship. His talent and inventiveness are apparent at Stoney Creek with each of the nines having a distinctive character. Perhaps the one of the best memories visitors will take away from a day of golf at Stoney Creek (aside of the views of the Blue Ridge Mountains rising above you) is that there is something for every skill level of player. The 8th hole at Tuckahoe for instance plays 165-yards over water from the back tees but is only 100-yards from the forward tee which is positioned so the water does not need to be carried. Or number 4 on the Monocan nine which plays downhill with mounds on the right and bunkers on the left from the tee. Playing the tips from 420-yards necessitates a long straight drive however the most forward tees are 80-yards less, setting up a chance for a drive that could roll all the way to the bottom of the slope. 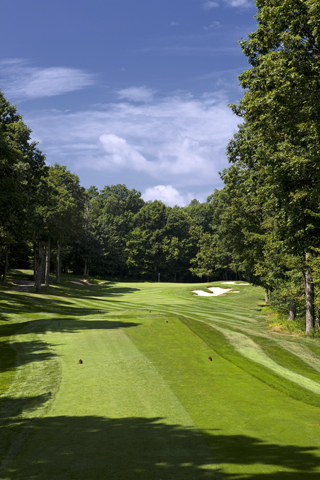 Completing the Wintergreen golf experience is the Golf Academy which is located at Stoney Creek and there are several one-day and multiple day packages to get your game the fix it needs. Not matter how you look at it both Devils Knob and Stoney Creek are fun to play and best of all will provide a challenge to every player. Wintergreen was purchased in 2012 by coal billionaire Jim Justice for $16.5 million and, before reselling it in 2015, invested a reported $12 million in capital improvements. Justice, who is currently running for Governor of West Virginia, is also owner of The Greenbrier in White Sulphur Springs, West Virginia. The present owner of Wintergreen is the publicly traded EPR Properties, a real estate investment trust (NYSE: EPR), and Pacific Group Resorts, Inc. operates Wintergreen under a long term lease. So, Wintergreen Resort is not just for skiers. The rest of the year it’s a mecca for outdoors activity with lots of stay and play packages plus an extensive tennis program, the Wintergreen Spa, hiking trails not to mention several restaurants. The one we liked the best is the Copper Mine Bistro with the menu alternating some really interesting choices. Visitors also like the Edge Restaurant with its casual atmosphere and what can only be labelled as a spectacular mountain view. 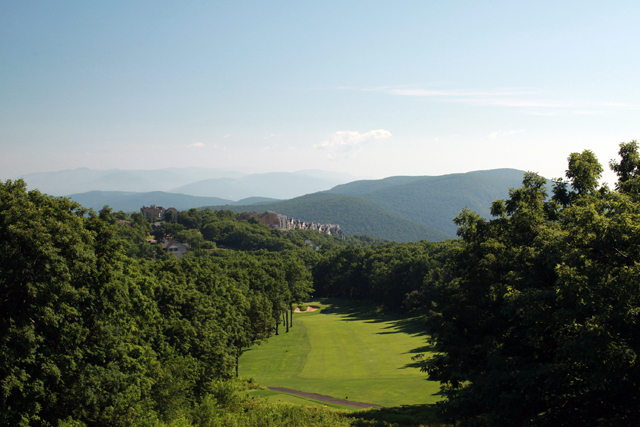 Wintergreen Resort should be on your short list for golf especially if you’re looking to for a break from summer heat or the opportunity to see the autumn colors along the Blue Ridge.